Rob Donoghue mentioned that his favorite RPG design technology of 2010 was Success-with-Complication." He and Fred Hicks draw an analogy to video games: "Missing is very rare in video games. 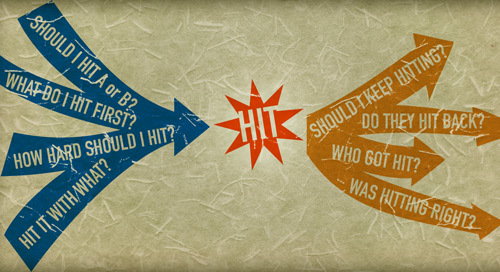 Question is not 'do you hit' but 'What happens when you hit'" This doesn't only refer to a combat scenario. It applies to any scenario where there is a question where it's more important to see the consequences of the answer than the answer itself. "Hitting" is just more impactful, if you pardon the pun. Let's assume for the benefit of the doubt that you have a game where the question really is "Do I hit?" What are the real possible answers? If "no," then often the only recourse is to try to hit again until you get a "yes." Alternatively, you keep getting a "no," until some endgame scenario, at which point you're not playing anymore. So, really, any functional answer is going to be "yes." This is the slim spine on which you build meaningful, forward-moving narratives. This is a tiny fraction of the branches, obviously. There are many more specific consequences that can come out of your particular game. For example, this was such a central concept in Do: Pilgrims of the Flying Temple that I just took "Success" as a given. I wanted my heroes to always succeed at whatever they do. Instead, I focused the question on how the world reacts to that event. In the game's terms, the question is simply "Do I get in trouble for succeeding?" You can add some branching paths leading to the hit, too. This tends to produce more analytical play, where you weigh the risks and benefits of hitting. This also works well in a "heist" scenario where the protagonists are planning how the job is going to proceed. You could even use it in a courtroom scenario or investigation scenario, as your hero builds up evidence against a defendant. Combining this with other post-hit branching paths creates a dense web of causes and effects, all based on the assumption that you're going to hit. And bear in mind, this doesn't even touch on the potential for games and stories where the "hit" is a failure. Imagine a game where you plan for an epic heist, knowing full well it will go down in flames. Consider an out-numbered army of Spartans standing against the entire Persian empire. What kind of story is that? Who are the heroes in that scenario? What makes that story fun to play? 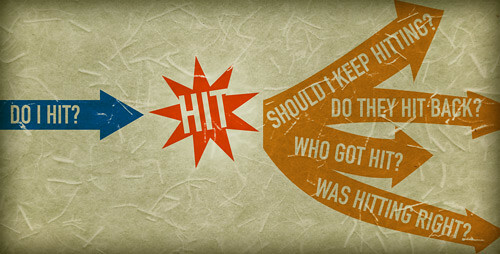 So, in other words, "hit" is an event in the story that can be taken for granted. Furthermore, it's such a pivotal event that you can view the whole story as pre-hit and post-hit. A hit can't be taken back, it can only be planned-for and reacted-to. Once again, I would like to point people (this time you Daniel) to Wushu RPG, which has been around since 2003. One of its biggest features is the Principle of Narrative Truth: what a player says, happens. (It is balanced with Veto and Coup de Grace rules) The mechanics indicate how much you progress towards your goal. The "hit" is anything that can move you towards your goal. This is, of course, also the central principle of improvisational theatre. I am guessing that none of the people here play many video games. "Missing" is, in fact, alive and well in video games. What video games tend not to do is a)waste your time on failure b)or C*** Block you with failure. Of course there are a number of cases that do both/either. So that makes me unsure exactaly what else to say. Yeah, nothing in the post is revelatory. It's just stuff I had to process visually for me to really understand thoroughly. It's one of those situations where you learn more by saying it in your own words, y'know? Very good stuff Daniel, thanks for the insight. Another good way to do it is to ask the players "Are you sure you want to hit?"